The North Alabama International Trade Association (NAITA) is a business-driven organization with the mission to promote economic growth through international trade education, training and networking. NAITA, a non-profit membership organization that began in 1983, provides an international networking forum, education on trade issues, and prepares business for global success. NAITA’s vision is to be the regional resource for international trade development. NAITA is managed by the Madison County Commission International Trade Development Center – Your Partner in the Global Marketplace. 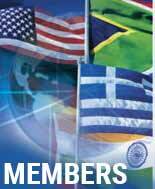 Membership is open to all organizations and individuals interested in or actively participating in international trade. NAITA has four levels of membership opportunities. Twenty-five employees or associates receive full benefits of membership. All Sustaining members are included in the NAITA membership directory along with industry affiliation. All employees of the SUSTAINING member are considered members with regard to special price concessions on NAITA programs. Special recognition at the World Trade Day luncheon and acknowledgement in the program. Acknowledgement as a Sustaining member on NAITA’s website, including company logo and link to company website. Acknowledgement as a Sustaining member in all appropriate NAITA publications produced throughout the year, e.g., NAITA Trade Connection e-News, meeting brochures, membership directory, etc. Recognition at meetings, seminars, workshops, etc. on the event program and in electronic display when possible. Ability to sponsor up to five full-time students. Join Online or Download a Sustaining Membership Application Form. Entitles a company to six members for $250.00 per calendar year. Corporate members will be listed on NAITA’s website. Join Online or Download a Corporate/Small Business Membership Application Form. Entitles a company with 10 or fewer employees or a non-profit organization to four members for $150.00 per calendar year. Small Business/Non-Profit members will be listed on NAITA’s website. Join Online or Download a Small Business Membership Application Form. Entitles one individual to full membership privileges for $50.00 per calendar year with NO COMPANY AFFILIATION recognized. Join Online or Download an Individual Membership Application Form. Entitles one student (currently enrolled in at least 9 college credit hours) to full membership for $20.00 per calendar year – NO COMPANY AFFILIATION recognized.